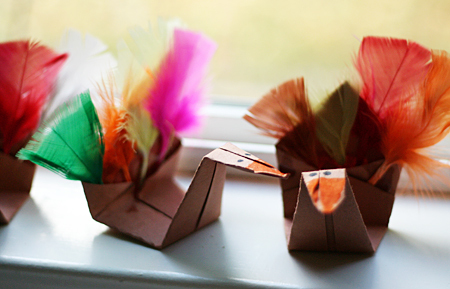 Here’s a little something for the big kids to help the little kids make for Thanksgiving – origami turkeys! The origami turkey is folded like a swan. We used a great origami swan photo tutorial at Marcel’s Kid Crafts. We used 6″ squares of construction paper, which is a little hard to fold, but worked okay. We were thinking they would make great place card holders for the Thanksgiving table – of course, that means we need to make a bunch more! I’ll be taking a little blogging break for a few days – I’m thinking this will be a good time to catch up on some reading time with a blanket and something warm to drink. Wishing you a warm & cozy Thanksgiving!